Mrs. O is always a Tru Fashionista with her fashion choices. She donned a navy blue embroidered dress and topped it with a matching coat from London designer Roksanda Ilincic, when she and President Barack Obama greeted the Chinese President on his US visit. 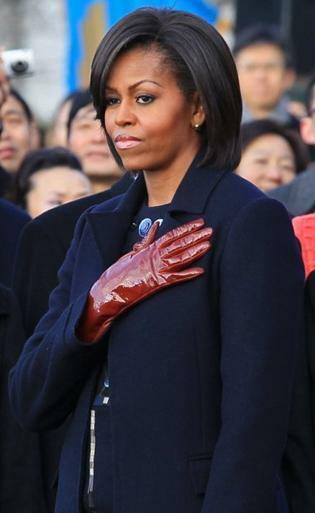 The red gloves, a Michelle Obama color signature style, is what makes her a Tru Fashionista. We can’t wait to see your gown for tonight’s state dinner.